How's this for last minute!! Paper is Bazzil and MME Fly a kite. 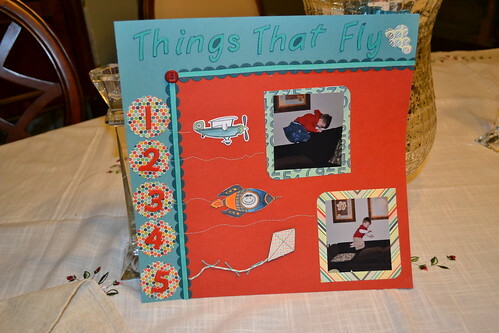 I used a bunch of PTI dies, Fly Away, the eyelet border, the scallop circle (or is that spellbinders ?) Ribbon is PTI twil cut in half. The numbers might be my favourite part of the whole page, they were inked in PTI Terracotta tile (2nd generation) and the embossed in clear versamark. This looks great, Rose! I love the numbers with the stitching linking them to their item! This is so cute, Rose. Love the colours an all the special details.